Substantial stone-built former manse with a range of outbuildings and its own pier, set in a fantastic shoreside situation on the island of Bressay, enjoying outstanding views westwards across Bressay Sound to Lerwick which is easily accessed by a seven minute ro-ro ferry journey. The property provides up to 6 bedroomed accommodation arranged over three floors and standing in around 0.9 acres or thereby including the main formal garden, two double garages, a tractor shed, two stores and a boat house. In addition to the six double bedrooms, some of which could be used as additional reception rooms, there is a large sittingroom, separate dining room, a spacious dining kitchen, separate kitchenette / laundry room and two bath / shower rooms. Central heating is provided by an oil-fired boiler. The house is presently used as a substantial family home but could suit B&B use. Viewing is essential to appreciate the fine setting of this property and the extent of internal and external space provided. 'Mizpah House' is situated in a great shoreside location on the island of Bressay which lies just off the east coast of mainland Shetland opposite Lerwick from which it is separated by Bressay Sound. The island which has a population of around 400, is served by a regular ro-ro ferry service which runs from the terminal at Maryfield on Bressay (about 1½ miles from the house) to the Esplanade right in the centre of Lerwick, the crossing taking just 7 minutes. The service generally runs hourly throughout the day with extra crossings at peak times. Although all the amenities of Lerwick are just a short ferry ride away, the island does have its own shop & post office (just along from the house), plus a marina, community hall, heritage centre and also a small hotel, restaurant & bar at Maryfield by the ferry. During the summer months it is possible to access the neighbouring uninhabited island of Noss which is a National Nature Reserve. Understood to date from 1819 this three storey, Grade 'C' listed, property sits in an area of ground estimated to extend to just under an acre. The house has been modernised in the past including installation of double glazed windows and oil-fired central heating supplied by a 'Thermorossi' boiler in the kitchen which feeds radiators throughout the house, hot water being provided by a 'Megaflo' tank in one of the bedrooms, however it would benefit from some updating. Nonetheless it provides a fine family home with the benefit of lots of internal and external space, and the stunning views across to Lerwick, the outbuildings potentially providing lots of scope for use as a studio or other work space, a home office, storage or perhaps even conversion to additional accommodation, subject to the usual consents required. The house is presently used as a family home however it may suit use as a B&B, subject to any consents required, the top floor suite of accommodation perhaps being used as owner's accommodation. Entry to the property is via a wood-lined porch with a window to the front of the house with arched fanlight over, stone flagged floor and an inner door to the hall. Large space with paneled doors to two large reception rooms and a passageway at the rear leading to a bathroom, the kitchen, and a side lobby with space for boots etc., and back door. A stair with original bannister leads to the first floor. Radiator. (Approx. 4.8m x 3.85m) (15'6" x 12'8") Good-sized room to the front of the house with TV point & radiator. (Approx. 4.75m x 4.45m) (15'6" x 14'7") Another spacious reception room, again to the front of the house, with exposed floorboards and a wooden fireplace surround with cast iron tiled fireplace (decorative only). Radiator. (Approx. 2.65m x 1.85m) (8'9" x 6') White suite including wash hand basin set in fitted cupboard / vanity unit, plus separate shower enclosure with electric shower. Radiator. Providing handy storage space. Stone flagged floor. (Approx. 5.25m x 4.4m) (17'3" x 14'4") Generously proportioned room facing south with modern units including an inset double bowl sink and plumbing for a dishwasher. A separate run of units houses a fridge and freezer both of which are included in the sale if required along with the 'Rangemaster' electric cooker which has a black glass splashback and cooker hood over. There is plenty of space for a large table & chairs and a tiled floor which extends into the hall passage. Telephone point. The carpeted stair leads up to a large first floor landing with window with built-in cupboard space below. Off the landing is the main bedroom and a further passage to two double bedrooms. There is a toilet to the half-landing. Radiator. (Approx. 5.9m x 5.4m) (19'4" x 17'9") Substantial room, originally used by the Church as the 'Guild Room' when the house was used as the manse, with two windows facing south providing lots of natural light and enjoying the fine view of the harbour approach. Heating is provided by a central heating radiator or a working open fire with wooden surround. Exposed floorboards & hot water tank. The passage off the main landing has a window looking across to Lerwick, a large shelved cupboard providing useful storage space, and doors to two generous double bedrooms, both west-facing and having a central heating radiator. (Approx. 4.8m x 4.45m) (15'8" x 14'7") With built-in wardrobe along one wall and fireplace although this is not useable. Telephone point. The stairs from the first floor which have a Velux window over, lead up to a second floor landing with built-in cupboard space & telephone point, leading to three bedrooms, a kitchenette and shower room. With the kitchenette & shower room, and three bedrooms, one of which could be used as a living room, the accommodation on the top floor could provide a self-contained suite of rooms. (Approx. 2.3m x 2.05m (floor area)) (7'6" x 6'9") Comprising a WC, wash hand basin, bidet & shower enclosure with electric shower. Fitted units provide lots of drawer & storage space. Velux window & radiator. (Approx. 4.85m x 3.45m (floor area)) (16' x 11'3") Large double bedroom presently used as an office, with two Velux windows, one with a great view to the sea, separate side gable window, built-in cupboard space & radiator. (Approx. 4.5m x 1.7m (floor area)) (14'9" x 5'8") With fitted units including an inset sink, space for a cooker etc., and plumbing for a washing machine. Two Velux windows. (Approx. 4m x 3.8m (floor area)) (13'2" x 12'6") With Velux window and side gable window again enjoying the fantastic view south. Built-in eaves cupboard space & radiator. (Approx. 4.4m x 4.05m) (14'6" x 13'3") Sixth double bedroom with west-facing Velux and separate side gable window, built-in eaves storage space, open wardrobe recess, TV point & radiator. As noted the site is estimated to extend to around 0.9 acres or thereby as shown on the plan. On the approach to the house from the north lies an extensive chipped parking area and two large double tandemgarages either side of a concreted yard area, both garages measuring approximately 9m x 2.95m (25'6" x 9'8"), the right hand garage having a separate side door and inspection pit. To the side of the left hand garage is a tractor shed (approx. 5.1m x 2.9m) (16'8" x 9'6"). A path leads around the side of the garages to the front porch with the main formal garden area which enjoys a westerly aspect and is enclosed by a stone dyke. It comprises two large lawned areas surrounded by mature shrubs and planting either side of a double glazed greenhouse (approx. 14' x 9'). At the foot of the garden a cast iron gate provides access to the stone-built boat house (approx. 5.25m x 3.25m) (17'3" x 10'8") which has a stone flagged floor and provides handy space for canoes, rowing boat etc., and the pier. A large grassed area between the main garden and the shore, which is enclosed partly by a stone dyke and by a fence elsewhere, also forms part of the property. On the south side of the house outside the side porch, is a large stone flagged courtyard and a substantial outbuilding measuring approx. 9.2m x 3.1m (13'2" x 10'3") which was originally the island's laundry house, and again has a stone flagged floor. To the side stone steps lead to a drying green. Finally the stone flags continue around the east side of the house to the north where between the house and the two garages is a further stone-built former byre (approx. 9.3m x 3.15m) (30'6" x 10'3"). 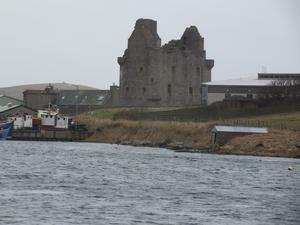 Scalloway Castle was built from 1599 by Patrick Stewart, 2nd Earl of Orkney to tighten his grip on Shetland, Scotland. Its site in Shetland's then capital, Scalloway, was surrounded by the sea on three sides. [ In 1568 Bishop Bothell was compelled to relinquish his rights and revenues to Lord Robert Stewart (father of Patrick)?, - and from that point ecclesiastical administration in Shetland was seriously hampered for a period of about 40yrs. There was more than once, a scheme for the erection of a presbytery in Shetland, but there is no evidence that a presbytery was in operation during this century. Moreover, the church authorities did not in this period enjoy effective support from the secular administration, for Lord Robert was abusing his control over ecclesiastical revenues, appointing creatures of his own to livings, and other laymen were diverting ecclesiastical funds to their own pockets through fues of lands and tacks of teinds, so that, although some Shetland benefices were very rich compared with the level in Scotland generally, only a small proportion of the income was sometimes reaching the clergy. Not infrequently a vicarage was in dispute between rival claimants, one appointed by the crown, the other by the Earl, and the man best qualified to serve the Parish did not always obtain effective possession. Some of the ministers, far from being conscientious, were mere adventurers, with moral standards no better, if no worse, than those of their parishioners leading to the gibe that " Shetland received nothing from Scotland except bad meal and greedy ministers". It is not for nothing that the 'ministers mark' for sheep is proverbially 'baith lugs aff' implying that he could make any mans sheep his own and that the words 'minister' and 'cat' are equally taboo on a fishing expedition (for the minister, with his right to tends, shared the cats greed for fish). Nor was rapacity the only clerical offence, for in Earl Patrick's time both John Sutherland , the reader in Aithsting and Sandsting, and William Hay, archdeacon of Shetland and minister of Tingwall, were found guilty of assault. Prior to Earl Patrick Stewarts rule, the administrative framework within which the people of Shetland had lived was largely based on the system which had been in use when the Islands were under Norwegian Rule, But now this framework of administration was an instrument in the hands of Earl Patrick by which he exercised his comprehensive powers under the title of “Chief Magistrate of Shetland”. In this capacity the court of Earl Patrick would go on circuit around the ten or eleven districts, into which Shetland was divided, dishing out his form of justice, settling disputes and collecting taxes. Teinds and Taxes were paid from all lands, and for centuries, prior to Patrick’s day, were usually divided between the vicars of the parishes and the Bishop. From 1586 all the Bishops revenues were drawn by the Earl, so that teinds and taxes were given partly to the Earl and partly to the vicar. Scottish immigration to Shetland was in progress in Earl Patrick’s day. Ministers, officials and merchants were certainly coming in from Scotland. There were also sometimes immigrants of dubious morals and reputation. On the 15th of May, 1604, the Earl issued a proclamation, relating in lurid language, that beggars, vagabonds and immoral persons from the Scottish Highlands “and other barbarous parts” have entered Orkney, devouring its substance and associating with the idle and immoral among the natives, and now intend to proceed to Shetland, “where they hope to have liberty to live wickedly according to the appetite of their filthy flesh,” and where they propose to establish a house of ill fame at Sumburgh. Patrick forbade the transport of those persons to Shetland, and commanded their forcible expulsion from his dominions if they didn’t leave voluntarily within 3 days. Literary sources indicate that he didn’t fully succeed in enforcing this effort. Bishop James Law supported the cause of the people of Orkney against the oppression of Earl Patrick, and he succeeded in getting the lands and jurisdiction of the Bishopric separated from those of the Earldom. (15) Donaldson, Gordon. (1958). In: Shetland Life under Earl Patrick. England: Oliver & Boyd.